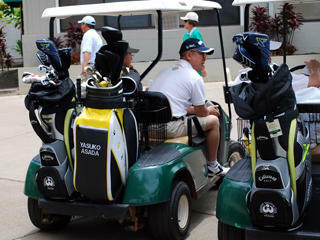 Volunteers drive the tournament. Bag reception team stands at the ready to assist arriving players unload their bags and take them to their carts. The bag reception crew in action. 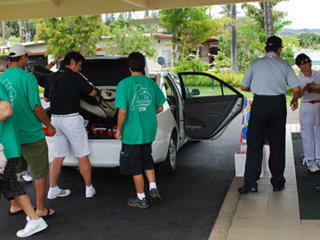 Checking in is a pleasure, thanks to a friendly, well-organized crew. 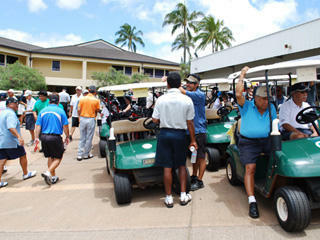 A field of some 186 golfers get ready to head out. Super volunteer Marilyn Chinen gets her scoring program ready for action. Every player wins something. 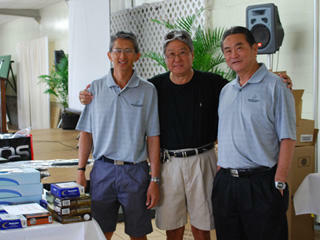 Here, tournament committee members Wendell Tom, Bill Sato and Steve Shishido organize the prizes for lucky golfers. 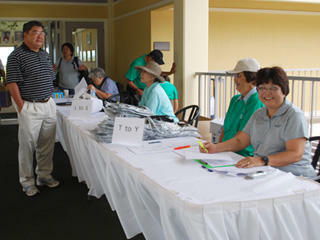 One of the unique features of the DSIF tournament is the Silent Auction tent, featuring unusual and one-of-a-kind items donated by David’s friends on the Japan and U.S. pro golf tours. Mrs. Yasuko Asada, the Foundation’s staunchest supporter, passed away just a few weeks before the tournament. Friends made sure that she was present in spirit. 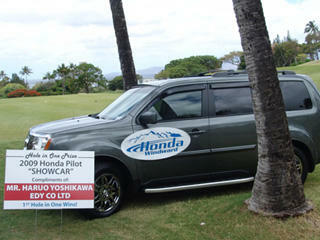 A fully loaded Honda Pilot donated by Mr. Haruo Yoshikawa of the EDY Co. was one hole-in-one prize. Two round-trips to Japan via Japan Airlines was the other. No one claimed them this year – maybe next time! 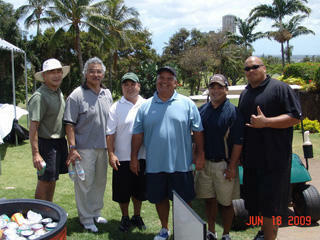 Golfers Alan Uyeda, Pat Ariki, Wintehn Park, Deron Akiona, Wade Kochi and Chris Naeole enjoy refreshments at the turn. 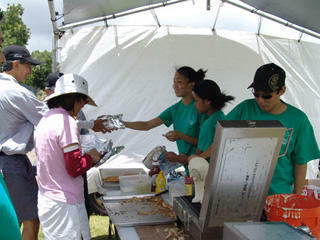 The ever-popular Waffle Dog stand was provided courtesy of Dayton Asato. 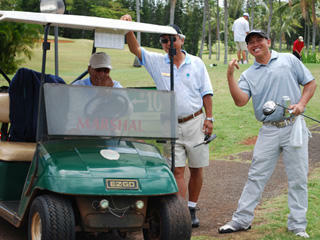 For $10, teams could get long-driving Hawaii high school standout Henry Park to hit your tee shot on Hole #1. 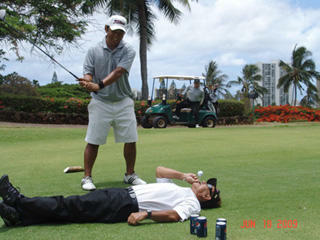 Henry has some fun with recently retired (and always zany) Titleist honcho Les Tamashiro. For another $10 teams could also buy a long drive off of the #10 tee, courtesy of the irrepressible Joe P (Phengsavath), shown here with his trusty driver and special lubricating fluid in hand. Scores get posted – no sandbagging allowed here. 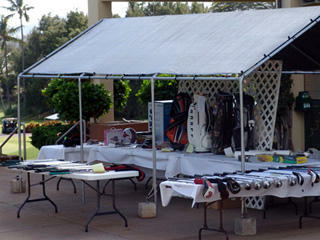 In spite of a late shower, golfers flock to the silent auction tent looking for great bargains. 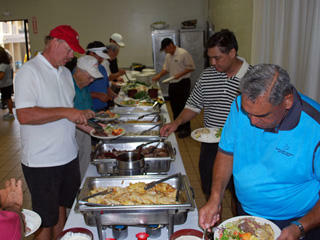 The food at Pearl Country Club is always topnotch – and there was plenty of it. A poster announcing that the DSIF College Scholarship was being renamed in honor of the late Yasuko Asada is adorned with pikake – her favorite. 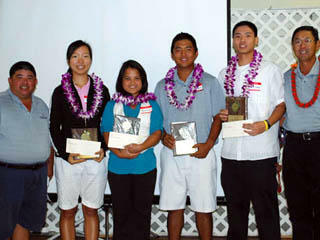 The real winners are Hawaii’s young golfers. 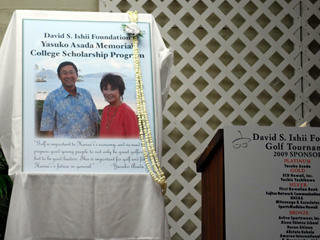 (L-R): DSIF Yasuko Asada Memorial College Scholarship Program Chair Dayton Asato, Anna Jang, Dana R. Cadiz, Henry Park, Oscar Y.S. Chang, and David Ishii. 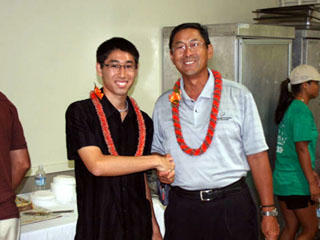 David congratulates Monte Ito Memorial Scholarship winner Daniel Tanigawa. 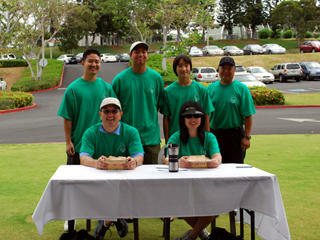 Grand Prize: Each member of Mrs. Yoshie Yoshikawa team won a set of Titleist irons. Many people say that this year’s DSIF HHSAA state golf championships were the best ever, thanks in large part to the host Kaanapali Golf Resort on Maui. 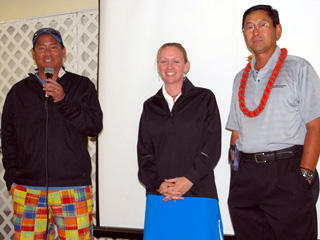 David recognizes Ed Kageyama, director of golf at Kaanapali, and Melissa Ludwig, Kaanapali marketing director, for their hard work and generosity.